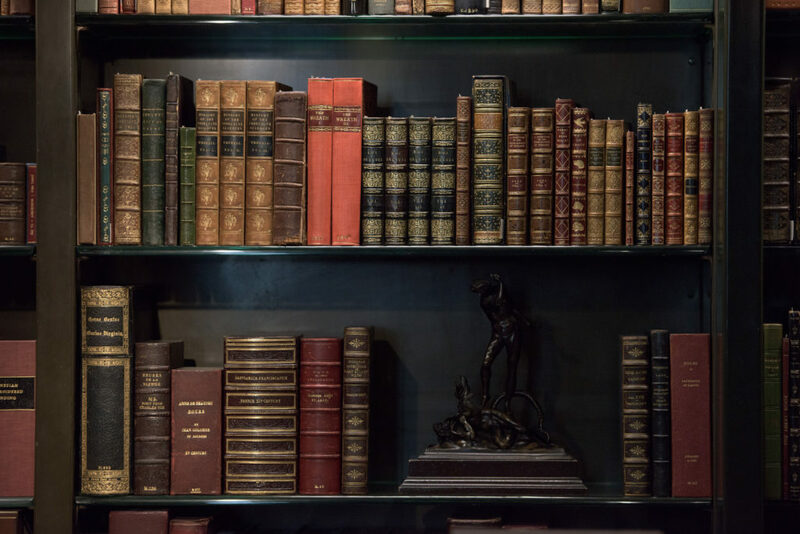 Welcome to our research library! We understand that finding reputable scientific literature with public access can be difficult and frustrating. Here, we regularly update our database with peer-reviewed, published scientific articles with “open access” so that anyone may access the full text. We urge everyone to research topics that interest them. Don’t hesitate to reach out to us with any additional requests. Title: Ketamine for chronic pain: risks and benefits. Authors: Niesters, M., Martini, C. and Dahan, A.
Abstract: The anaesthetic ketamine is used to treat various chronic pain syndromes, especially those that have a neuropathic component. Low dose ketamine produces strong analgesia in neuropathic pain states, presumably by inhibition of the N-methyl-D-aspartate receptor although other mechanisms are possibly involved, including enhancement of descending inhibition and anti-inflammatory effects at central sites. Current data on short term infusions indicate that ketamine produces potent analgesia during administration only, while three studies on the effect of prolonged infusion (4–14 days) show long-term analgesic effects up to 3 months following infusion. The side effects of ketamine noted in clinical studies include psychedelic symptoms (hallucinations, memory defects, panic attacks), nausea/vomiting, somnolence, cardiovascular stimulation and, in a minority of patients, hepatoxicity. 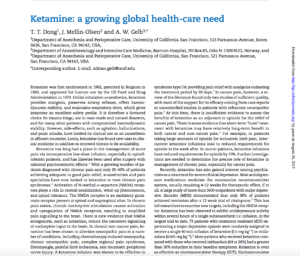 The recreational use of ketamine is increasing and comes with a variety of additional risks ranging from bladder and renal complications to persistent psychotypical behaviour and memory defects. Blind extrapolation of these risks to clinical patients is difficult because of the variable, high and recurrent exposure to the drug in ketamine abusers and the high frequency of abuse of other illicit substances in this population. In clinical settings, ketamine is well tolerated, especially when benzodiazepines are used to tame the psychotropic side effects. Irrespective, close monitoring of patients receiving ketamine is mandatory, particularly aimed at CNS, haemodynamic, renal and hepatic symptoms as well as abuse. Further research is required to assess whether the benefits outweigh the risks and costs. Until definite proof is obtained ketamine administration should be restricted to patients with therapy-resistant severe neuropathic pain. Abstract: Background Descending inhibition of pain, part of the endogenous pain modulation system, is important for normal pain processing. Dysfunction is associated with various chronic pain states. 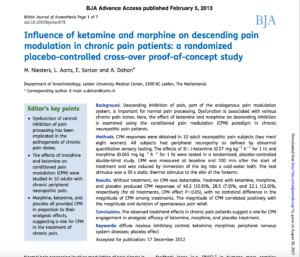 Here, the effect of ketamine and morphine on descending inhibition is examined using the conditioned pain modulation (CPM) paradigm in chronic neuropathic pain patients. Methods CPM responses were obtained in 10 adult neuropathic pain subjects (two men/eight women). All subjects had peripheral neuropathy as defined by abnormal quantitative sensory testing. The effects of S(+)-ketamine (0.57 mg kg–1 h–1 for 1 h) and morphine (0.065 mg kg−1 h−1 for 1 h) were tested in a randomized, placebo-controlled double-blind study. CPM was measured at baseline and 100 min after the start of treatment and was induced by immersion of the leg into a cold-water bath. The test stimulus was a 30 s static thermal stimulus to the skin of the forearm. Results Without treatment, no CPM was detectable. Treatment with ketamine, morphine, and placebo produced CPM responses of 40.2 (10.9)%, 28.5 (7.0)%, and 22.1 (12.0)%, respectively (for all treatments, CPM effect P<0.05), with no statistical difference in the magnitude of CPM among treatments. The magnitude of CPM correlated positively with the magnitude and duration of spontaneous pain relief. Conclusions The observed treatment effects in chronic pain patients suggest a role for CPM engagement in analgesic efficacy of ketamine, morphine, and placebo treatment. 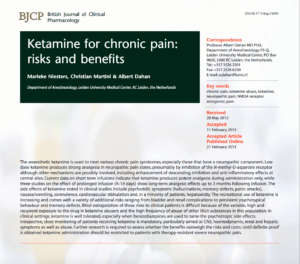 Abstract: BACKGROUND: Ketamine is used as an analgesic for treatment of acute and chronic pain. While ketamine has a stimulatory effect on the cardiovascular system, little is known about the concentration–effect relationship. We examined the effect of S(+)-ketamine on cardiac output in healthy volunteers and chronic pain patients using a pharmacokinetic–pharmacodynamic modeling approach. METHODS: In 10 chronic pain patients (diagnosed with complex regional pain syndrome type 1 [CRPS1] with a mean age 43.2 ± 13 years, disease duration 8.4 years, range 1.1 to 21.7 years) and 12 healthy volunteers (21.3 ± 1.6 years), 7 increasing IV doses of S(+)-ketamine were given over 5 minutes at 20-minute intervals starting with 1.5 mg with 1.5-mg increments. Cardiac output (CO) was calculated from the arterial pressure curve obtained from an arterial catheter in the radial artery. Ketamine and norketamine plasma concentrations were measured. A novel pharmacokinetic–pharmacodynamic model was constructed to quantify the direct stimulatory effect of ketamine on CO and the following adaptation/inhibition. RESULTS: Significant differences in pharmacokinetic estimates were observed between study groups with 15% and 40% larger S(+)-ketamine S(+)-norketamine concentrations in healthy volunteers compared to CRPS1 patients. 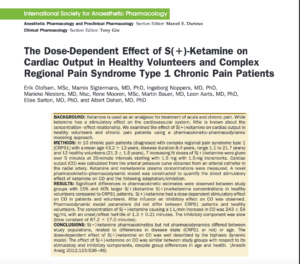 S(+)-ketamine had a dose-dependent stimulatory effect on CO in patients and volunteers. After infusion an inhibitory effect on CO was observed. Pharmacodynamic model parameters did not differ between CRPS1 patients and healthy volunteers. The concentration of S(+)-ketamine causing a 1 L/min increase in CO was 243 ± 54 ng/mL with an onset/offset half-life of 1.3 ± 0.21 minutes. The inhibitory component was slow (time constant of 67.2 ± 17.0 minutes). CONCLUSIONS: S(+)-ketamine pharmacokinetics but not pharmacodynamics differed between study populations, related to differences in disease state (CRPS1 or not) or age. The dose-dependent effect of S(+)-ketamine on CO was well described by the biphasic dynamic model. The effect of S(+)-ketamine on CO was similar between study groups with respect to its stimulatory and inhibitory components, despite group differences in age and health. Abstract: In the United States, millions of Americans are affected by chronic pain, which adds heavily to national rates of morbidity, mortality, and disability, with an ever-increasing prevalence. According to a 2011 report titled Relieving Pain in America: A Blueprint for Transforming Prevention, Care, Education, and Research by the Institute of Medicine of the National Academies, pain not only exacts its toll on people’s lives but also on the economy with an estimated annual economic cost of at least $560 – 635 billion in health care costs and the cost of lost productivity attributed to chronic pain. 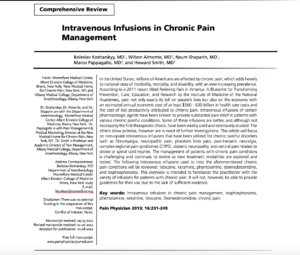 Intravenous infusions of certain pharmacologic agents have been known to provide substantial pain relief in patients with various chronic painful conditions. Some of these infusions are better, and although not necessarily the first therapeutic choice, have been widely used and extensively studied. The others show promise, however are in need of further investigations. This article will focus on non-opiate intravenous infusions that have been utilized for chronic painful disorders such as fibromyalgia, neuropathic pain, phantom limb pain, post-herpetic neuralgia, complex regional pain syndromes (CRPS), diabetic neuropathy, and central pain related to stroke or spinal cord injuries. The management of patients with chronic pain conditions is challenging and continues to evolve as new treatment modalities are explored and tested. The following intravenous infusions used to treat the aforementioned chronic pain conditions will be reviewed: lidocaine, ketamine, phentolamine, dexmedetomidine, and bisphosphonates. This overview is intended to familiarize the practitioner with the variety of infusions for patients with chronic pain. It will not, however, be able to provide guidelines for their use due to the lack of sufficient evidence. Abstract: Hyperactivity of N-methyl-D-aspartate (NMDA) receptors may be one of the factors in the genesis of neuropathic pain (NP). Ketamine is a dissociative anesthetic and analgesic that is the most potent NMDA receptor antagonist currently available for human use. 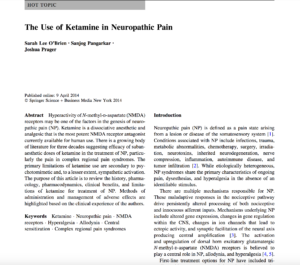 There is a growing body of literature for three decades suggesting efficacy of subanaesthetic doses of ketamine in the treatment of NP, particularly the pain in complex regional pain syndromes. The primary limitations of ketamine use are secondary to psychotomimetic and, to a lesser extent, sympathetic activation. The purpose of this article is to review the history, pharmacology, pharmacodynamics, clinical benefits, and limitations of ketamine for treatment of NP. Methods of administration and management of adverse effects are highlighted based on the clinical experience of the authors. Abstract: Ketamine was first synthesized in 1962, patented in Belgium in 1963, and approved for human use by the US Food and Drug Administration in 1970. Unlike inhalation anaesthetics, ketamine provides analgesia, preserves airway reflexes, offers haemodynamic stability, and maintains respiratory drive, which gives ketamine an excellent safety profile. It is therefore a favoured choice for trauma triage, use in man-made and natural disasters, and for many other patients with compromized haemodynamic stability. However, side-effects, such as agitation, hallucinations, and panic attacks, have limited its clinical use as an anaesthetic in affluent countries. Lately, ketamine has found new uses in clinical medicine in addition to renewed threats to its availability.